When a ride gets scheduled, more often than not, these same people will be requesting a ride back. A ride back can either be going to the dealership or the passenger's house or office. Since the information is already stored or created in the earlier request, we added a new feature of scheduling back for the customer easier. The Schedule Ride back button is now added in the command center. Ride backs are now more accessible, faster and in a click of a button, the information will be auto-completed. Service Advisors needs to click on the submit button to complete the process. Scheduling a ride has now become more convenient. You can click Schedule a Ride on any completed ride, to request them a trip back. A Ride Back is a drop-off request meaning the Passenger is coming from the station and going to a new location. When you Schedule a Ride Back, this means that the passenger will be going back to the station. From the ride list select the passenger that that needs a ride back. In the passenger's ride flyout click on Schedule a Ride back. 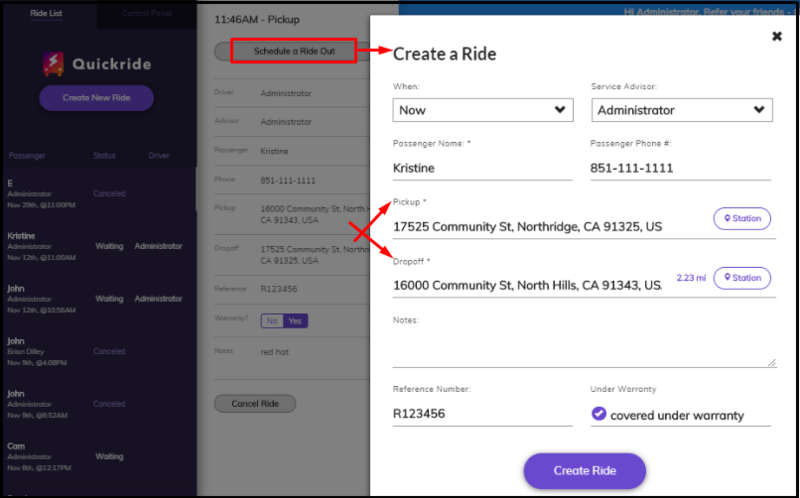 Once clicked, the create a ride form will get filled up with the passenger's information. The FROM is will from where the passenger got dropped off earlier, and the TO is at the station. Once validated, click on submit. A Ride Out is a pick-up request meaning the Passenger is coming from a new location and going back to the station. When you Schedule a Ride Out, this means that the passenger will be going to a new location. From the ride list, select the passenger that that needs a ride. In the passenger's ride flyout click on Schedule a Ride Out. Once clicked, the create a ride form will get filled up with the passenger's information. The FROM is at the station, and TO is the new passenger location.